yup, great work and very interesting to follow your steps. I've been watching the views on the thread so I know folks are reading it. I enjoy writing it and since I expect this all to take some time, I think of it as a journal to look back on. That said; I've decided to change direction. Looking at what September holds for family, home, kids going back to school, time will be more limited to work on the boat. Which means the best case is maybe two trips out this year? So I've decided to flip, strip, and repaint the entire hull, including fixing the hog in the bottom, vs. just doing the bottom. I've decided to flip it onto the trailer as my working platform, and have started taking off all the bits and pieces, Check back for pictures and updates. 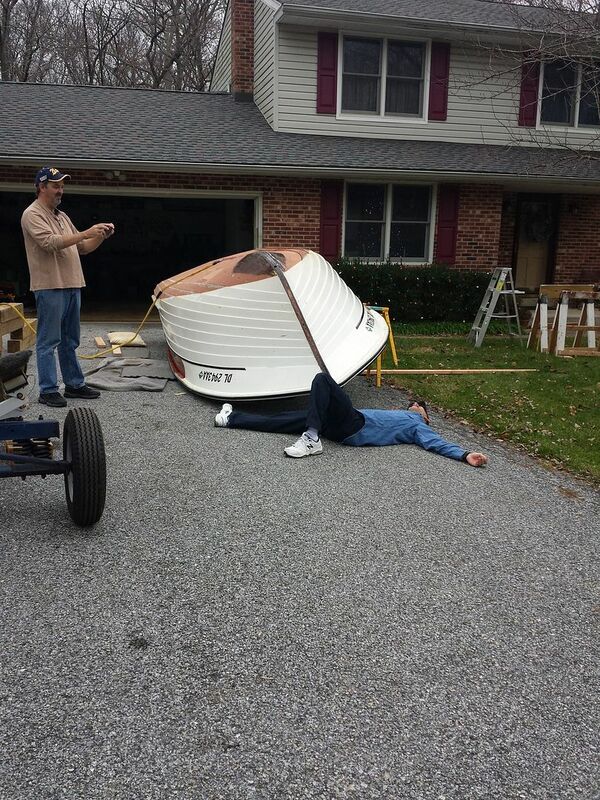 I've decided to flip the boat over on to the trailer as the work platform. So I took everything off the trailer and stored it out of the way. Lights, light bar, wiring, winch post, and fenders. Maybe over kill, but I wanted everything out of the way, and was planning to replace the crappy lights and repaint the fenders anyway. 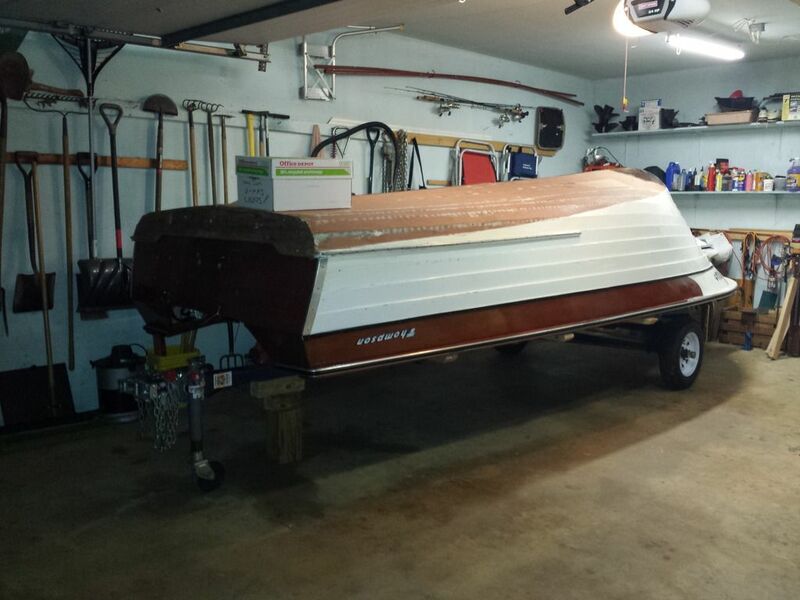 Plus, having all that off the trailer made it sooo much easier to get it back under the boat. Stripping the trailer took all of an hour. 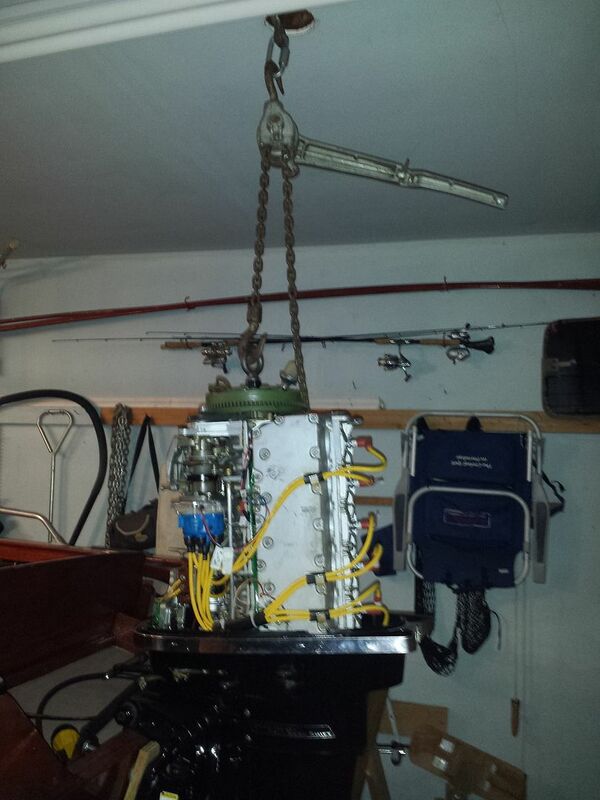 So step one, dismount the engine. About 90 minutes Start to finish. 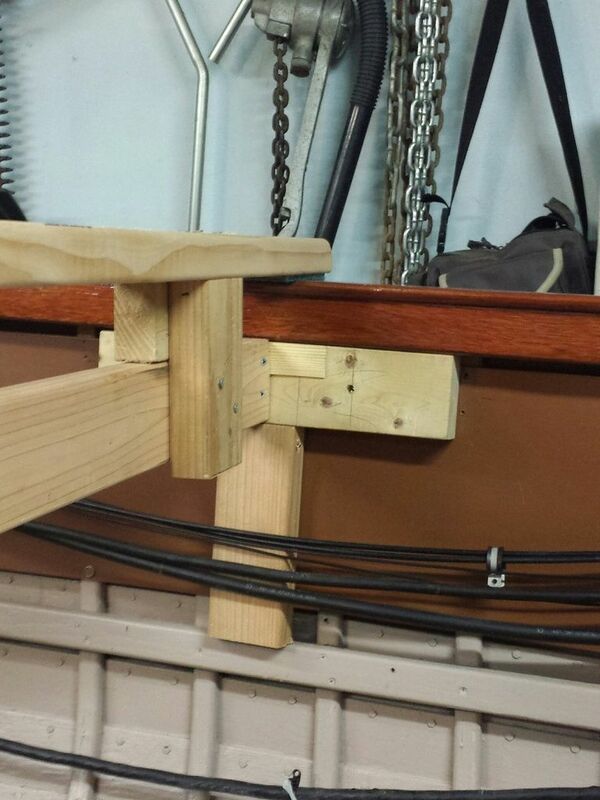 Several years ago I rigged a lifting point in the garage. A beam in the attic laid across 6 of the ceiling joists, and shimmed and fastened so that a load is distributed more evenly across the joists and the beam can't shift or roll. Then a chain wrapped around that, with the hook end dangling through a hole in the ceiling. A come-along hooks to that and to a lifting ring on the motor. Note that come-alongs are not meant for lifting (vs pulling) but this one is rated for way more than the motor weighs, but I make sure I am always in a position to 'jump-away' if it lets go for those 3 minutes when the engine is hanging free. 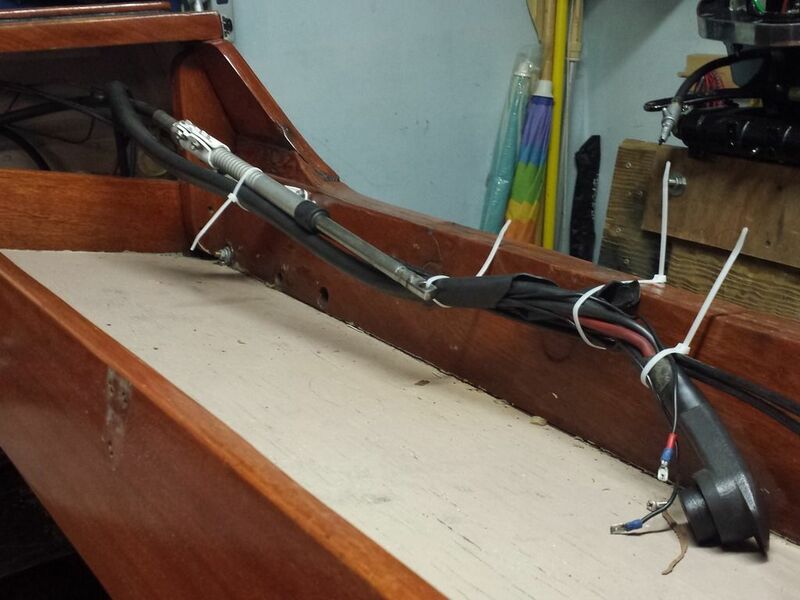 To remove the transom bolts, I found that lifting the motor slightly to take the weight makes it easy to push the bolts out. Same approach as before to protect the threads. Spin the nut off until the top of the nut is flush with the end of the bolt. Wood block over the nut, hit the block with a hammer to drive the bolt out. Then take the nut the rest off the rest of the way and use a carriage bolt of a lesser diameter than the bolt your are driving, and using that as a driver, hammer the bolt the rest of the way out. The engine stand. I have a walk-in basement shop, and the door is around back. I prefer to keep the engine there when off the boat, but have to drag it through the grass and at 300 pounds, the little casters just sink right in. 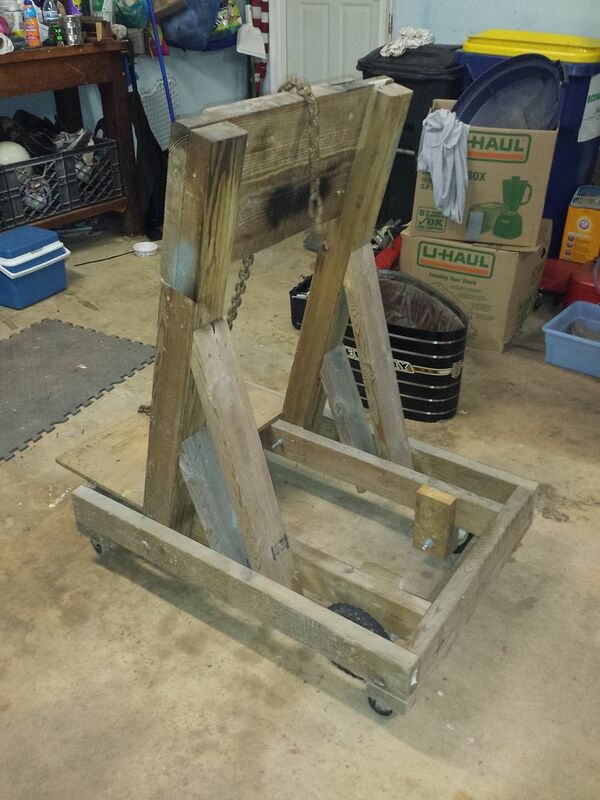 So I added two larger wheels from a lawn mower that are mounted about an 1/8 inch higher. When on concrete, they don't touch. But going through grass, the big wheels prevent the stand from sinking in. Brilliant!!! I've started the proccess of removing hardware and such. 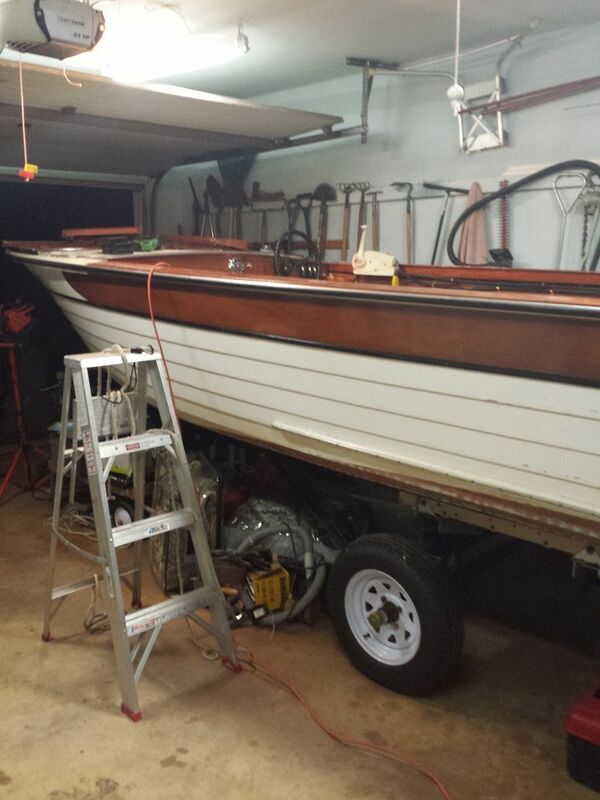 The rails are off and I like the look of the boat better without them. The rails (I believe they called them dodger rails) distract the eye from that nice sheer line. 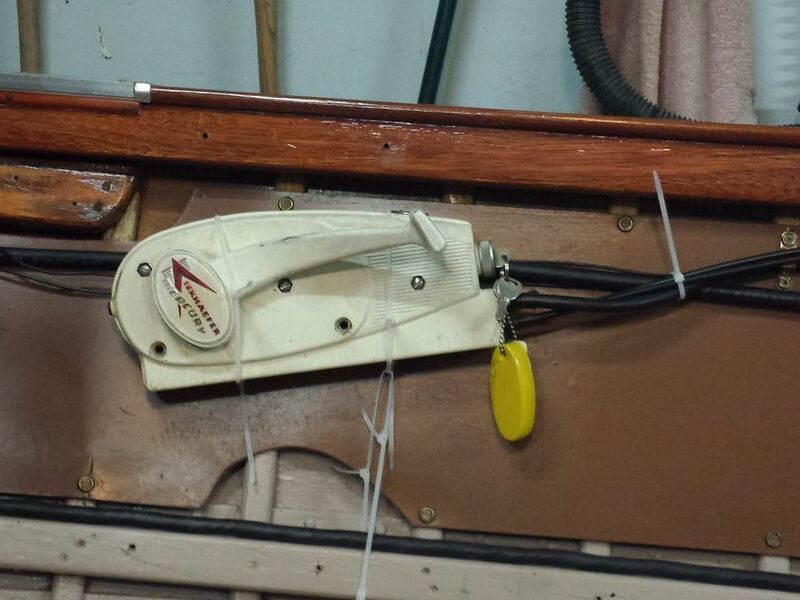 So I will set it up so they can be easily installed and un-installed, but leave them off when she hits the water. 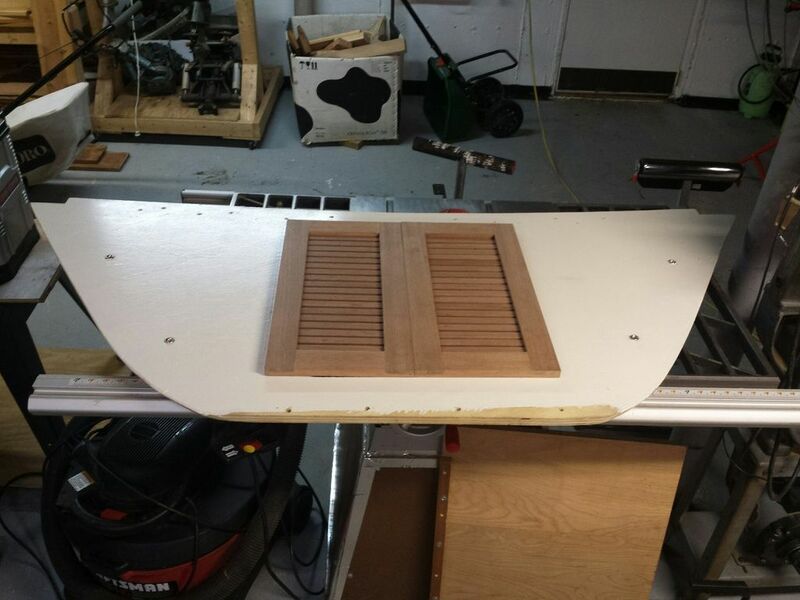 Besides, with the rails off a Bimini top will be a much easier prospect. All the hardware is off. Left is the windshield, steering wheel, and engine controls (which I'll just unbolt and tie off vs. take fully off). I thought the steering wheel would come right off but looks like I'll need a wheel puller which I have, but of course can't find. 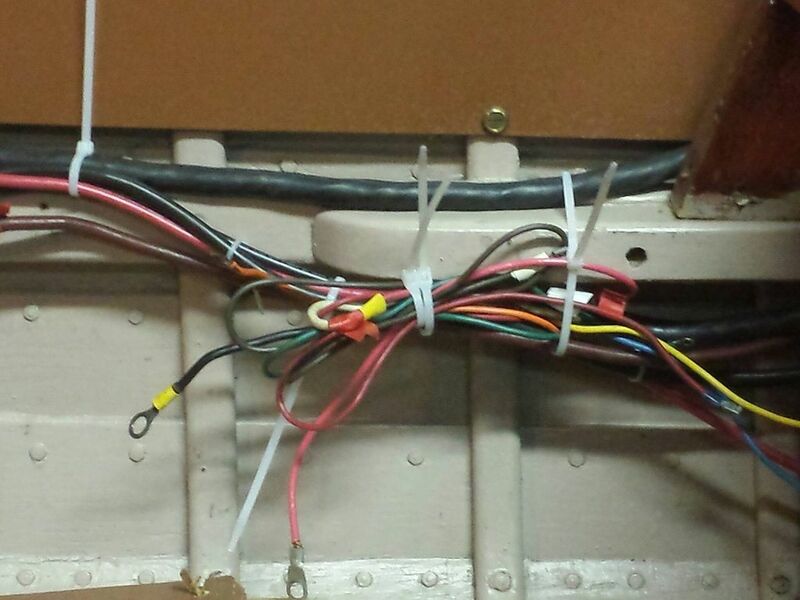 Then secure other items that won't be coming off such as the wiring harness. Following that, braces for the hull. Then buy beer to lure the helpers to my house and flip her over. 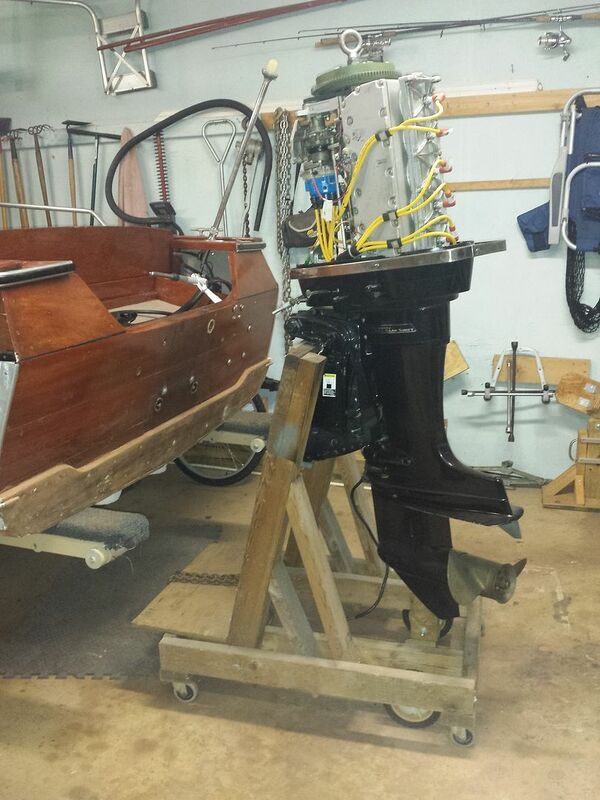 Trying to catch up to Steve whose stripping his hull in the thread "Bottom Repair and refinish! Removed all the stuff on the boat that I would need to in order to do the flip. In the process of taking the windshield off I was struck with how loose-y Goose-y it was fastened together. When I took the front windows out, the framing was darn near floppy. The screws won't tighten down as they just start to spin in their holes. So, I'll address that during reassembly. The good news is all the components are in super solid shape. All the other stuff like cables, wires, and controls, etc i zip tied in place so that they are not flopping around during the flip or hanging down once flipped. These 'new' bulbs are much more resilient in a drop light than incandescent bulbs. Seems that the incandescent bulbs blow out with the slightest bump. This bulb has survived some major drops and bangs with no issues. Burning is never good! Last time I 'smelled burning' I was working under the dash of my wife's bug. Sat up to see white smoke pouring out from under the cowl. I''ll not even get into the time I had to unload my fire extinguisher on the Merc, which was still on the back of the boat! progress has slowed due to that thing called "life". Today I was able to spend an hour or so putting in the first of three braces to support the hull structure when I roll it over. Over engineered as usual. There will be another near the stern, one near the dash. 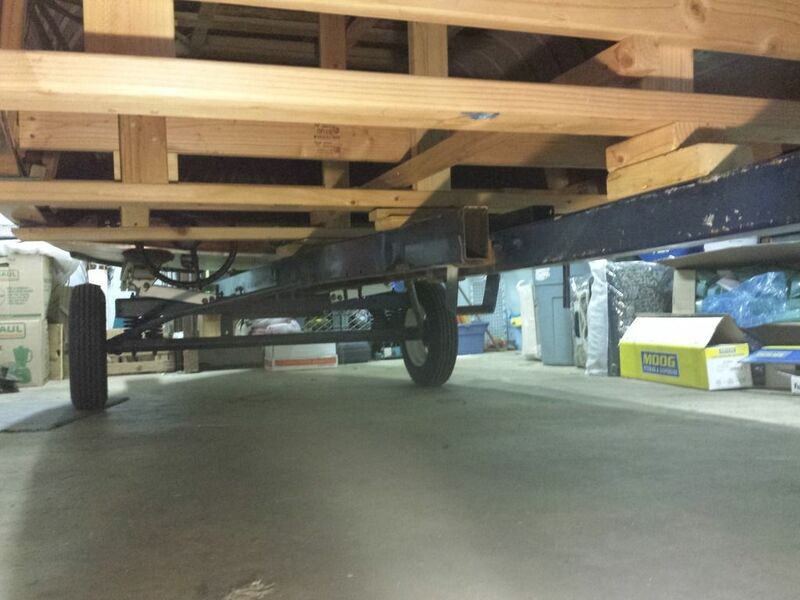 The idea is they will double as the beams that the hull will rest on when on the trailer. 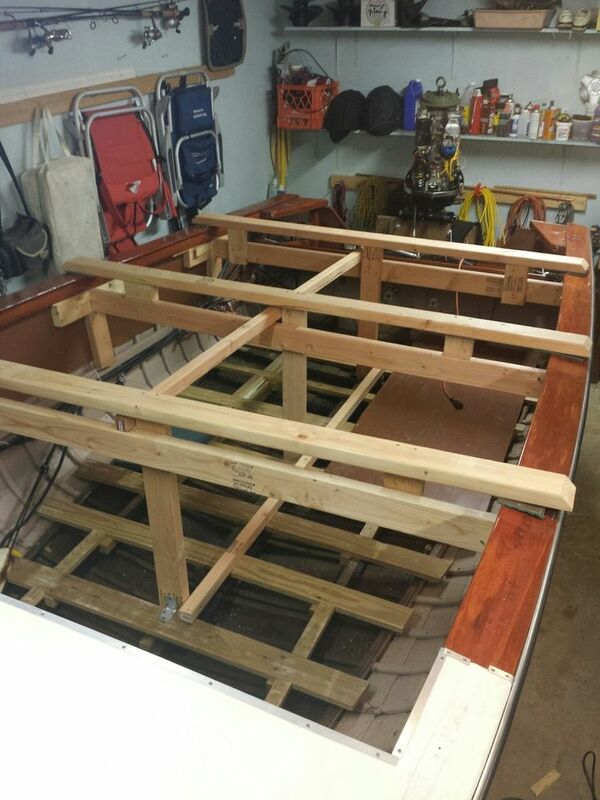 The deck will rest on the bunks, the rest of the hull on these braces. Note that they are not screwed to the hull. Rather, they are a compression fit. 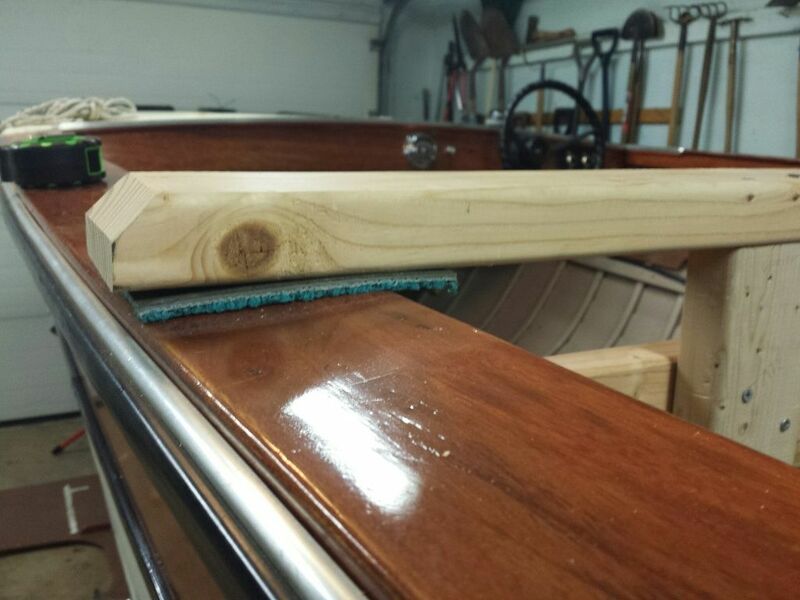 Note also that that "T" shaped piece spreads out the load across three ribs and the bottom of the T rests on the thwart (is that the right name for that piece of wood that runs the length of the hull), and the piece in the middle runs down to the keel and is notched over it. And, to protect the gunnels, a piece of rubber backed carpet. Like i said, get some young, fat boys over; and do it! Not much progress to report. Life has been demanding of late. I've installed three 'rollover braces'. As i said before, totally over engineered. But, I want to have the hull on the trailer and these braces will support the hull when I roll it, and when it is on the trailer. 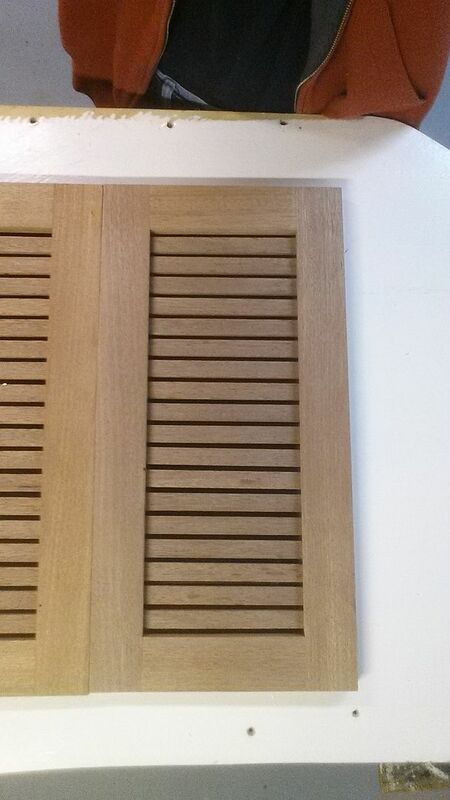 Over the course of the summer I built these doors out of mahogany that I recovered from a neighbors family room..... Ugly box beams, but mahogany (according to the guy at the lumber yard). Here they are set on the bulkhead from under the dash/deck. They will be framed in with more mahogany. I have enough that I could veneer the entire bulk head but no sure how it would look. Today three brothers came by and between the four of us rolled her over and up onto the trailer. 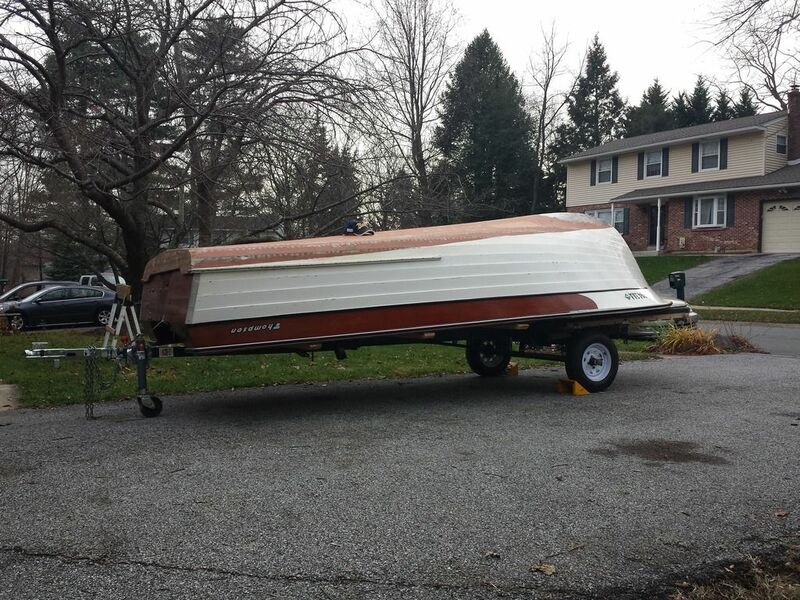 To prepare to roll it off the trailer onto the ground, I lifted the boat up off the trailer a few inches. 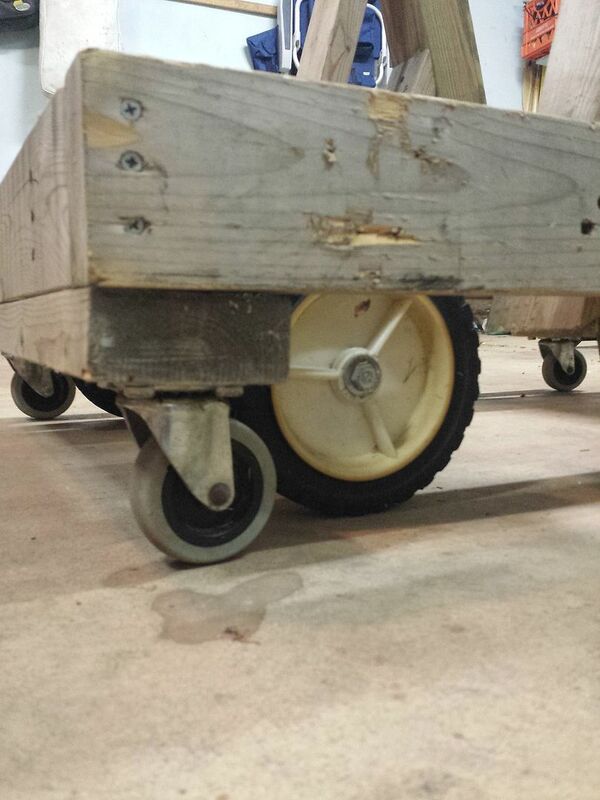 Raised the rollers that go down the center of the trailer, and lowered the bunks. 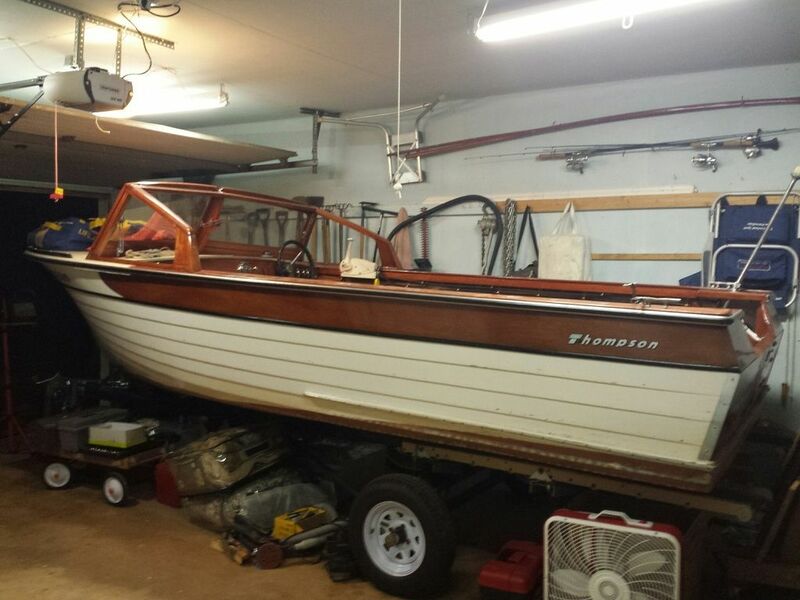 Put the boat back down and now the boat is sitting on rollers, not on the bunks. Then opened the 'tilt lock' on the trailer. Three of us at the bow lifting up and pushing back (the trailer is wheel chocked) and she rolled off, stern to the pavement. 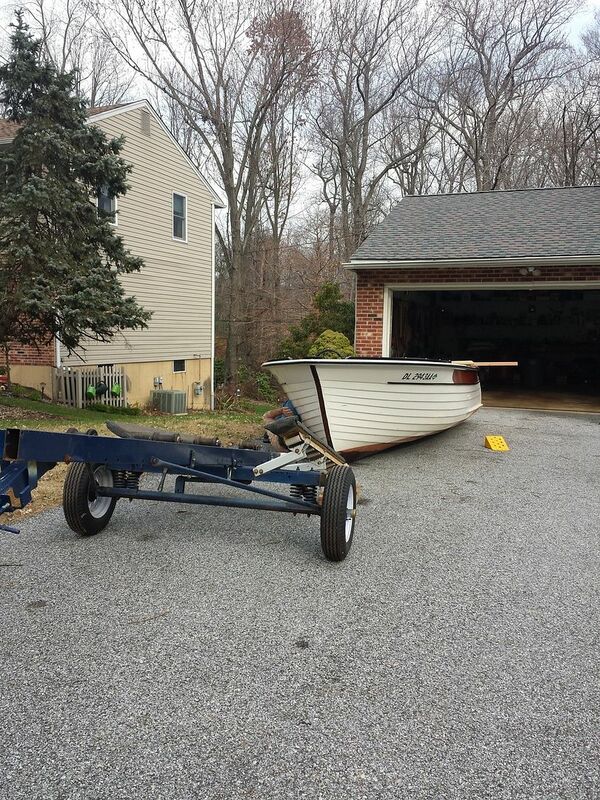 Then just let the weight of the boat push the trailer the rest of the way out and presto! She's on the ground. Note the straps attached to the braces. Next, three guys lift up on the Starboard side, the forth adds blocks under the boat. Lift up, add a block, lift up, add a block. What a collection of goobers! To roll the boat, two guys are on one side pushing on the bottom (straps in hand), two guys on the other side pulling on their straps. Up and over easy peasy. As the boat passed the mid point, the guys on the 'on-coming' side drop the straps and catch the boat, the guys pushing on the bottom use their straps to slow the roll, and between us gently let the roll continue onto three saw-horses set in place for the boat to land on. Safety tip, before rolling it we made sure the escape path for the guys on the on-coming side was clear. Don't want to be falling over stuff when you are trying to get away from a falling boat! 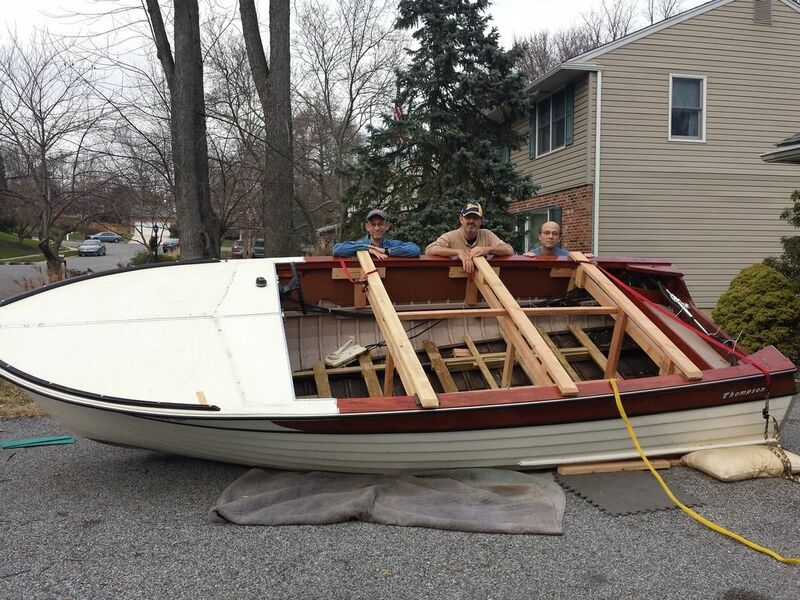 Now with the Port side on the three horses, we lifted the Starboard side and slide blocks under, raising that side to leve the boat. Then, turned the trailer around and rolled it under the boat. Some jigging & jogging to maneuver the trailer around the steering wheel which I could NOT get off, and she was upside down on the trailer. 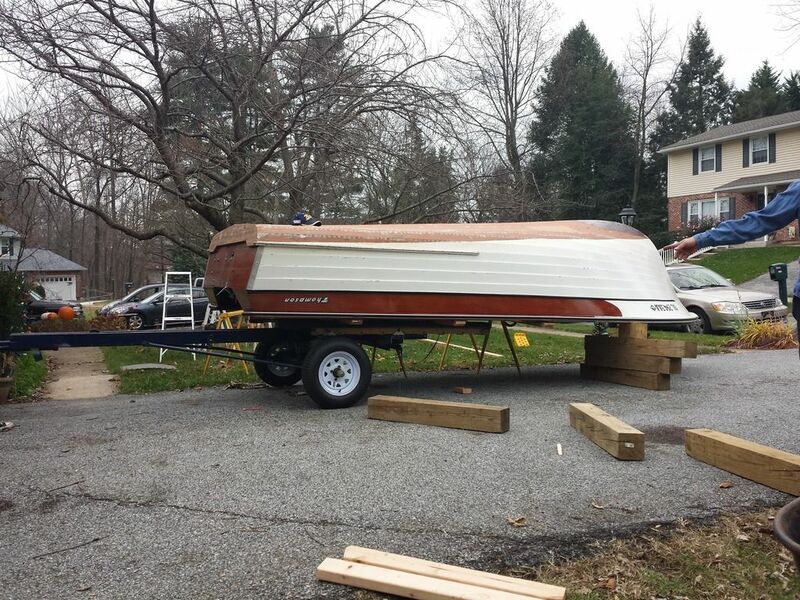 The bow is sitting on the bunks, and the braces are sitting on the trailer rail. 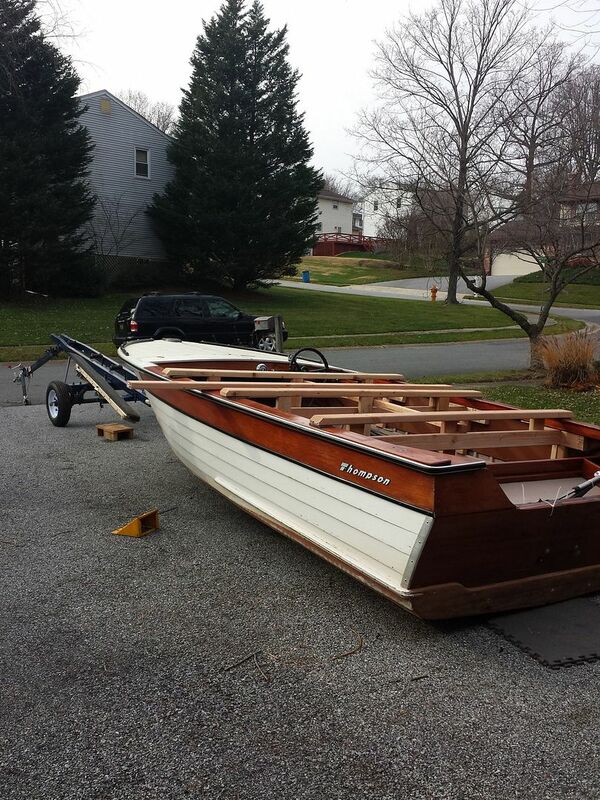 Note the the braces are centered on the trailer, and that the center post of the brace is aligned with the main keel so that the weight of the boat is transferred from the trailer to the keel. 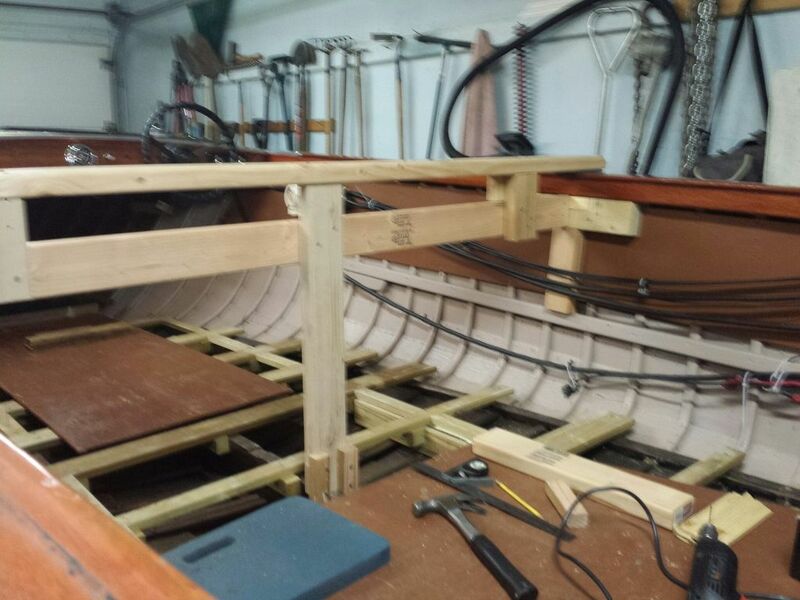 I will have additional supports on the gunwales when she sits over the winter. Now I can roll her around as needed. Get ahead, Peter! Looks great. Loved seeing the bottom of yours. Different from mine...does yours slide in the turns? 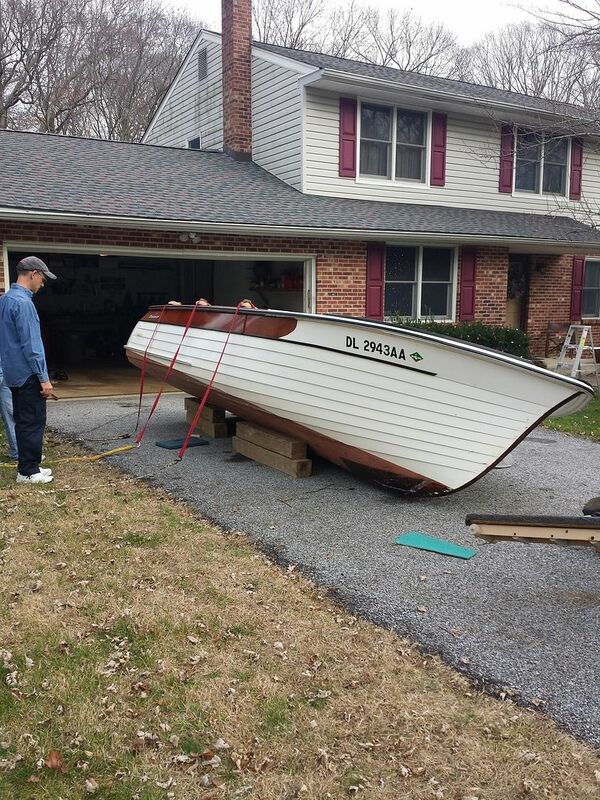 As you know, mine has the 8' keel that i had to have re-made. Have Fun!